Although the skies looked threatening right before race time, 58 runners and walkers lined up at Market and Church Streets in West Chester for the 2nd Annual Volunteer English Program Family Fun 5K Run/2.5 Walk event on October 12, 2013. 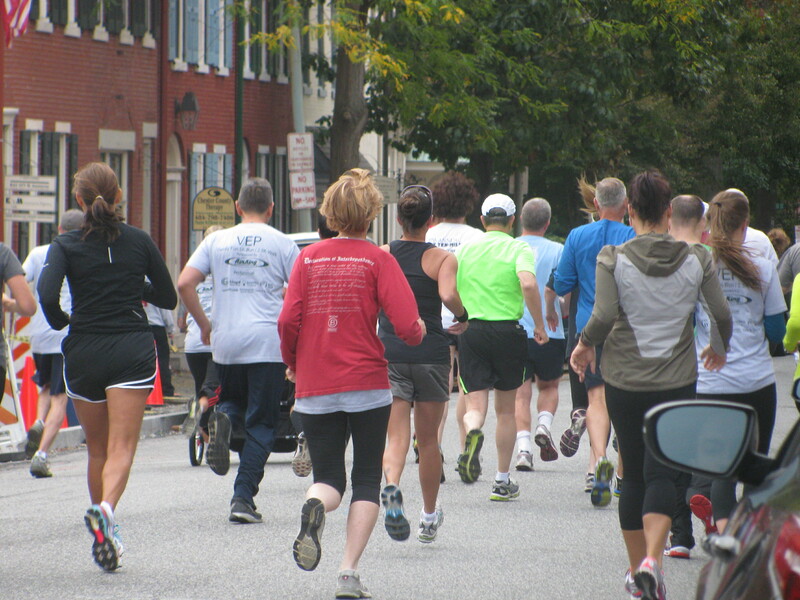 As runners and walkers made their way through West Chester, the sun burst through and made it a beautiful race day. We would like to congratulate 5K runners John Matthews (18:46 time) who placed first in the Men’s group, Constance Franklin (22:32 time) who placed first in the Women’s group, and Stephen Heck (19:57 time) who placed first in the under 16 group. Stephen also qualified as second place finisher for the best overall Men’s Group. In the 2.5K Walk category, over 28 individuals completed the beautiful downtown West Chester borough course in under 40 minutes. Jack McVety bested the 12 and under group with a time of 17:22, with older brother, Colin closing in at 17:14. This year’s registrants ranged in age from 9 to 65+. 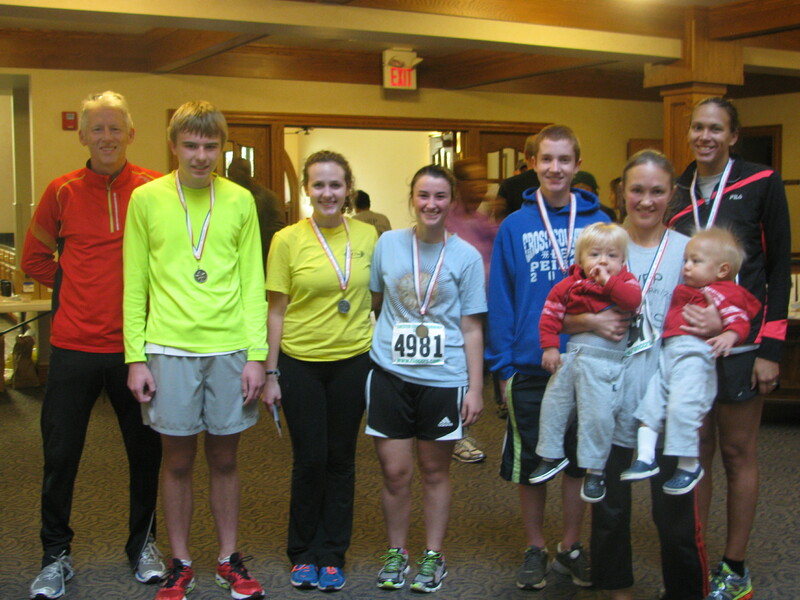 All runners and walkers enjoyed refreshments, awards and fellowship at The United Methodist Church on High Street following the race. We want to thank all the race sponsors, private donors, and the almost 100 participants who have contributed to our mission of providing free English tutoring to adult immigrants and refugees. We look forward to seeing everyone again next year! View the race results here! View the complete photo album here! Maria’s letter is transcribed below for easier viewing. Last year, Maria came to our office to ask for a tutor. She was breathless and nervous, speaking with urgency as she explained that she had “waited long enough” to learn English. She came from Mexico 16 years ago, she explained, but working full time to support herself and her child had demanded all of her time and energy. It had always been her dream to improve her English and become a United States citizen, but her life was so busy. Now she needed help. After several months on our waiting list (due to our constant need for volunteers), Maria finally came back to our office to meet her tutor. She couldn’t stop smiling! This September, Maria’s tutor, Sandy, called to tell us that Maria had become a United States citizen, purchased a new home, and obtained a new job! Maria wrote us the pictured letter, something she could not have done a year and a half ago. It is transcribed below. Congratulations to Maria! May each year be full of growth and accomplishments. “I had a dream to speak English better and become a U.S. citizen. Three years ago I went to Volunteer English. I took the test. No one called. In January, I called Volunteer English and said, “This is my year!” I went back and took the test again. Then Patty called me. I’m so excited I have a tutor. “My tutor and I met at a restaurant. I will remember that day forever. My tutor told me that “pero” is Spanish, in English I have to say “but.” Oh boy! My cheeks were red. I said “I cannot say this bad word.” A man at the next table said, “That is a normal word in English.” We laughed a lot. Now we meet at the library. I spoke English with my tutor. We read funny stories and laughed more. I was not nervous to speak English any more. “The librarian told me lawyers would come to the library. They would help me. The lawyers were so nice to me. I filled out the application. “Wait… Wait… Wait… I practiced writing sentences for the citizenship test. I studied the cards with the questions for the test.